The bakery and cake shop of Kasalta is one of the most sought after Cuban-Spanish Deli shops by the beach. 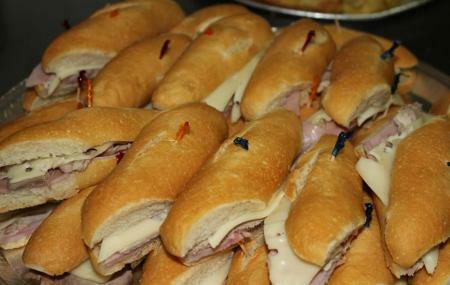 It specializes in fresh homemade bread, sandwiches, Spanish hams and wines apart from their signature on-site dishes. If you are in a hurry, you can walk up right to the counter to order from the delicious looking colourful cookies, chocolates, cakes, pastries, breads and pies while the friendly staff at the counter will be happy to suggest you the items you should go for. Some of the Kasalta specialties are Chickpeas with Chorizo, Roast Beef Angus, Anchovies in Vinegar and Olives, Octopus salad, Wild asparagus, Mushrooms with Serrano Ham and Paella Mariner. People normally club together Santurce Marketplace and Fort San Jeronimo while planning their visit to Kasalta. Best food we had on the island. I'm a vegetarian and it can be hard sometimes finding traditional Caribbean places with great options but the spinach crapes, fried plantains, and desserts were AMAZING. Very friendly staff and amazing food for lowest prices in the area. I can see why it's a local favorite! Not a bad place but kind of overrated. After it had been highly recommended by a friend my girlfriend and I went for a sandwich. Nothing special about the food. Went back again to see if maybe it was just a fluke but again nothing special. Not bad but I've had better in several Cuban bakeries in Miami. Nice easy going place. Good strong coffee with a decent breakfast. Was able to split a scrambled egg, ham, and cheese meal with my lady and not break the bank. Seen a good mix of tourists and locals here. A wide array of pastries that I will have to try next time I come back to PR. Excellent for snack and dinner. Service was a little confusing but wait and counter staff were very helpful. Try the seafood casserole— more like a stew but delicious! If it’s good enough for President Obama, it’s good enough for me! Good place. They’ll put football (soccer) on for you if a big game is on. Food is good, wine selection is very good. Perplexed as to why they call it “expresso” here though.